Preceded in death by granddaughter Sue Sheeley. Survived by wife of 60 years Betty; children Ross (Sandy), Beth (Al) Stroschein & Chris (Tammy); sister Donna (Jerry) Huisenga. Also survived by 8 grandchildren, 7 great-grandchildren, many nieces & nephews. 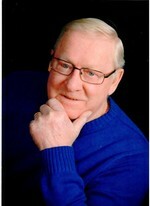 Memorial Service Saturday 11:00 am at GRACE LUITHERAN CHURCH, 149 8th Avenue South, South St. Paul. Family will greet friends Saturday 10:00 -11:00 am at Church. Interment Oak Hill Cemetery. In lieu of flowers memorials preferred.